T’ai Chi Chih classes, as well as other related T’ai Chi forms, are becoming more and more popular as a growing number of people seek healthier ways of living. According to “Canada’s Physical Activity Guide to Healthy Active Living for Older Adults”, physical activity is one of the most important things you can do to maintain your physical and mental health and quality of life as you grow older. The Guide goes on to say how everyone can benefit from increased physical activity, and how people with physical limitations and chronic conditions can also benefit by becoming more active. As an accredited T’ai Chi Chih teacher since 2003, the age range of my students has been from 9 – 95, including some using wheelchairs. The range of benefits has been just as great. T’ai Chi Chih® Joy Thru Movement(pronounced Tie Chee Chuh) is a form of gentle movement that can be enjoyed by almost anyone. The moves can be done sitting or standing.One can enjoy great benefits by doing T’ai Chi Chih everyday for 15-20 minutes, doing all the moves or choosing only some. Originated by Justin Stone in 1974, T’ai Chi Chih® Joy Thru Movement differs from the more familiar traditional T’ai Chi which has 108 movements and emphasizes the full range of joint and muscle movement. T’ai Chi Chih is a different series of 19 simple, gentle moves and one pose, with the emphasis simply on energy flow, focusing on feeling the soles of the feet as you stay grounded. The moves enjoy names like Bird Flaps its Wings, Joyous Breath, Pulling Taffy, Working the Pulley, and Passing Clouds. The soft, non-strenuous, relaxing moves may have a special appeal for the growing 50+ age group as well as older seniors. The spine remains straight, shoulders relaxed, with no leaning or twisting, and with gentle flexing and extending rather than stretching and reaching. No great amount of balance is required but both balance and co-ordination are greatly enhanced. Without any undue stress on muscles or joints, the softness helps strengthen both. The focus in T’ai Chi Chih is on letting go of tension stored in the body. Softness is the essence of T’ai Chi Chih. The gentle, repetitive moves are designed to help stimulate, circulate and balance the flow of Chi, the natural, vital universal energy in our bodies. The repetitions aid the remembering, including at a cellular memory level. Once the energy is balanced, it flows freely throughout the body. The mind, body and spirit become more centred, and inner serenity, good health and vitality result. Circulating and balancing the Chi, Justin says, is one of the great secrets of life and is essential to good health. In contrast to many other forms of exercise, T’ai Chi Chih focuses on improving body-mind-spirit awareness by “tuning in rather than tuning out”. The slowness of the moves and the focused concentration encourage physical and mental relaxation. Hence, it is referred to as “a moving meditation”. Some form of such relaxation is critical in dealing with modern everyday stress and stress related disease. T’ai Chi Chih is thus a way of doing something for yourself that makes you feel better while drawing on your own natural resources. Justin, now 91, still teaches T’ai Chi Chih. He suggests that T’ai Chi Chih is not really an exercise the way we think of exercise since there is no perspiration, no great effort, and no fatigue associated with it. He adds, though, that it is perhaps the best exercise you can do … like massaging your body from the inside out. Most students feel they have more energy after doing T’ai Chi Chih than when they began. He also describes it as “the effort of no effort”, like moving in slow motion as in a dream, or floating through really thick air. Once learned, the moves can readily be done on your own. With only a few feet of floor space needed, and no special clothing required, the movements can be done almost anywhere. Though easy to learn and do, it is best to first learn them with an accredited teacher. Practice videos/DVDs are also available. Students’ reasons for learning T’ai Chi Chih range from simply being curious and wanting to learn something new, to wanting to relax, feel better, and have more energy and better balance. Some also come hoping for some relief from health problems, including chronic pain, arthritis, asthma, headaches, poor sleep, or fatigue. Individuals seem to get what they need, finding it both enjoyable and effective. Many of my students describe it as relaxing, gentle, peaceful, or soothing. Others love the softness of the moves, the renewed energy it gives them, and the slow and gentle pace which many say is quite a welcome change from the rest of their lives. On a lighter note, several students have commented on how “Carry the Ball to the Side”, in particular, could even help improve their golf swing! New York’s “DAILY NEWS” Hometown Paper May 18, 2003 edition published an article entitled “For Seniors Only”. 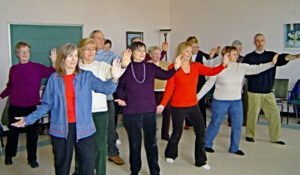 It highlighted specific T’ai Chi Chih benefits for seniors such as better balance, fall prevention, flexibility, reduced rate of hip fracture, helping prevent osteoporosis…though these particular benefits are surely sought after by far more than seniors. The January 2004 issue of Tufts University Health and Nutrition Letter has reported significant benefits related to pain, stiffness, strength, mobility, balance, and improved overall functioning in daily tasks for people with arthritis who regularly did forms of T’ai Chi over a 12-week period. That same newsletter documented one woman’s story of using it to deal with cancer, concluding with “perhaps the slow, graceful moves may help to lessen the severity of the cancer symptoms or treatments and help improve the physical and emotional quality of life in the bargain. “A study in Prevention’s April 2004 edition done by UCLA Professor Michael Irwin in California supports T’ai Chi Chih as boosting adult immunity to the virus that causes shingles, with its implications for other viruses. Meanwhile, my personal T’ai Chi Chih journey has been an exhilarating one, helping me to live more fully each new day as it unfolds. My life today is increasingly more serene, more focused, more open, more free. I enJOY a new kind and new depth of energy amidst life’s continuing challenges as well as its delights … feeling very much alive and well, more grounded, growing and grateful … and continually amazed. The Chinese have a saying: “You cannot appease the appetite by reading the menu. You have to eat the food”.